I had the shelf already. It was in our dining room of our old house, but it didn't fit in the new so I took it for my sewing room. It was wood colored so I painted it (behr embellished blue is the color). I Love the way it looks now. Anyway, I got a cheap roll up shade and some gridded flannel. I glued the flannel to the shade using Aleene's Fabric Fusion. Hint: let it dry well before rolling up the shade. Then we mounted the hardware to the inside of the shelf brackets and installed the shade. It rolls down easily. A little touchy going up but I'm getting the hang of it. I had to increase the tension because of the extra weight of the flannel. I've never had a design wall so I have no idea how much I'll use it but I'm happy to have it. I paid about $23 for the roller shade, a dollar or two for the brackets, and about $20 for the flannel (it was a little expensive but I wanted the grid). The width of the shade is about 60". And yes I put the flannel on crooked. I had to work in sections. lol. If I was doing it again I would have started at the bottom where it's easier to tell if it's straight. Very nice!! 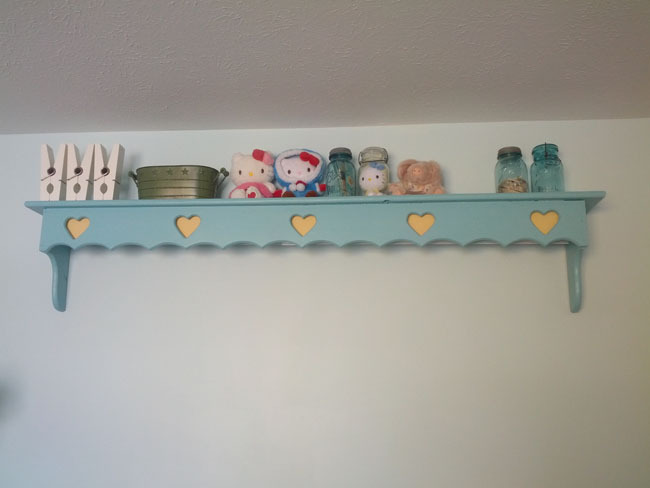 Great repurposing of that cute shelf, too. Where did you find gridded flannel? Great idea! A good repurposing(is that a word?) and decorating project! If it works for you, that is what is most important. Love the shelf. I have some shelves without the trim. Hope to get them painted and mounted on the wall this spring. Great idea Gale. Love your clothespin thingies too! Very good re purposing I like it! I bought those things about 10 yrs ago with big plans and now I can't remember what they are. lol. I figure they look cute on the shelf anyway. I love the colour of the shelf and the whole design of it...great job....is the flannel the Kaffe Fassett stuff...? 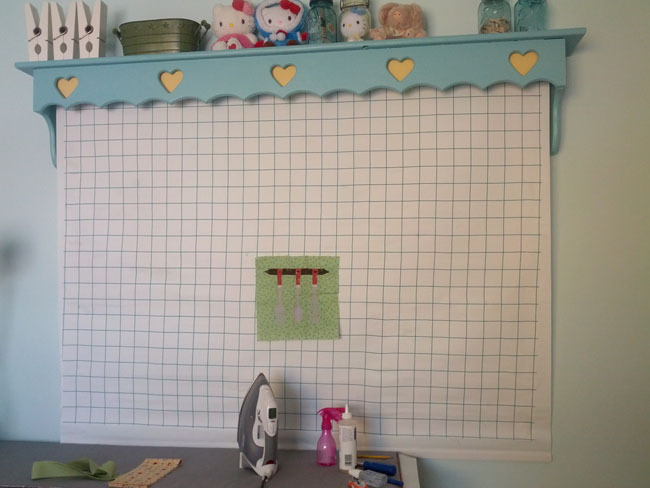 I think you will be very surprised and happy with just how handy dandy a design wall is once you begin using it ..great project. thank you for sharing - I love it! How clever! Looks really neat! That is great! It is attractive and so very clever! Thank you so much for sharing. I need to find somewhere for one of these! They also sell it by the yard at Mary Jo's Cloth Shop in Gastonia, NC. I believe its in the Notions department. Just call their 800 #.